PRODUCT DESCRIPTION: This lightweight orthosis is designed to comfortably restrict motion of the wrist and thumb while holding the hand in a neutral position. 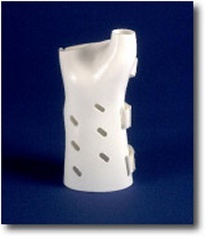 It is fabricated of specially formulated orthopedic grade thermoplastic whose unique characteristics offer durable performance and long lasting reliability. The orthosis provides rigid “cast-like” immobilization of the wrist, hand, and thumb without obstructing the webspace between the thumb and forefinger. A foam tongue insert provides additional padding for the styloid process. For a custom fit the Orthosis may be trimmed using cast scissors and formed using a heat gun. Two cotton stockinet are included to provide a more comfortable, hygienic interface and promote wicking of moisture.